While he’s quick to tell you his first restaurant stint was at age 15 working as a buffet attendant at his local Hometown Buffet, this humble chef got his real start with the late Charlie Trotter in Chicago. From the Windy City to the City of Angels, Chef Samaniego spent seven years with David Myers working at the restaurateur-chef’s high profile Los Angeles dining destinations – first at Sona and the next five years at Comme Ça. He then went on to make a name for himself as the Executive Chef of Little Sparrow in downtown Santa Ana where the restaurant earned such accolades as Best New Restaurant by the Orange County Register as well as Restaurant of the Year by Orange Coast Magazine. Last April, Chef Samaniego went from the OC to the LBC as Chef de Cuisine for Michael’s On Naples. 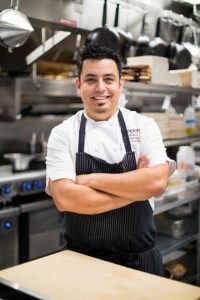 Born in Orange, California, and raised in the state’s Central Valley, Chef Samaniego is a graduate of Johnson & Wales University in Denver where he studied Culinary Arts and Food Service Management. While there’s no doubt he’s a natural in the kitchen, he also proved to be equally comfortable in front of a camera when he appeared on Bravo’s “The Best Restaurant” a few years back.